Whether it is your personal car or your company’s vehicles, the right amount of coverage you need is our specialty. 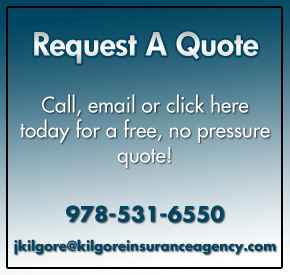 Kilgore Insurance Agency represents a wide variety of premier car insurance companies in the state of Massachusetts. Our experts can price multiple companies to save you time and money….While finding you the right car coverage at the right price. From comprehensive and collision to specialized coverage, Kilgore offers a selection of coverage and policy limits. Find the car insurance coverage you want at a price you can afford with the experts at Kilgore Insurance.